STREAMWOOD, Ill. (WLS) -- An ammonia leak at a food processing complex in northwest suburban Streamwood sent seven people to the hospital late Monday night, fire officials said. The Streamwood Fire Department responded just before 11:35 p.m. to a fire alarm at Fresh Express in the 1100-block of East Lake Street. Food, including packaged salads and vegetables, is processed at the large industrial building. Fresh Express staff told first responders there was a large ammonia leak in the refrigeration system. The business was in full operation at the time. All employees were evacuated, the fire department said. Several people said they had trouble breathing, fire officials said. Five employees were transported to St. Alexius Hospital for treatment. Two firefighters were exposed to vapors and sent to St. Alexius for evaluation. They are all expected to be OK.
Fire officials said the leak was determined to be a Level 2 Hazardous Materials Incident. 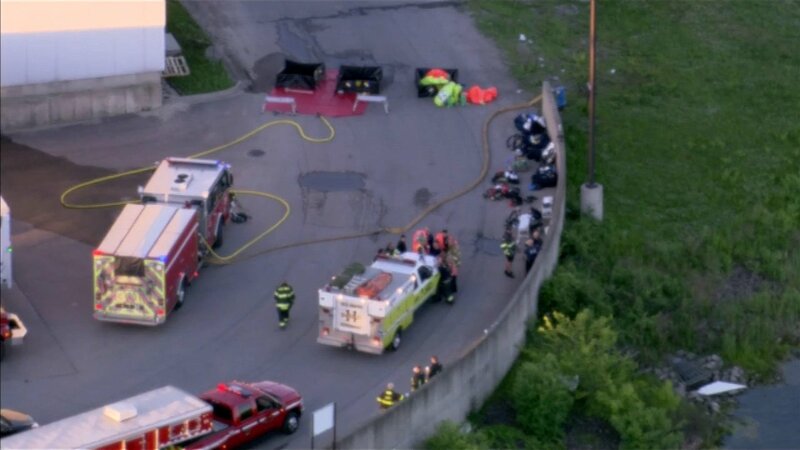 MABAS Division One Hazmat Technicians from Streamwood, Hoffman Estates, Schaumburg, Elk Grove Village, Elk Grove Township, Palatine, Mount Prospect, Arlington Heights and Rolling Meadows were called to the scene. They are expected to be at the scene for several hours, ventilating the building to bring chemical concentrations back to a safe level, fire officials said. Around the same time, firefighters received a report of a fire through the roof of a building in the 700-block of Bonded Parkway. They found flames in the rear of the building, which were extinguished. The fire department said there was about $50,000 in damage. No one was hurt. The cause of the fire remains under investigation.